The first verifiable mention of the Leonid Meteor Shower is from November of 902 CE. Why was this meteor shower was first recorded by Chinese astronomers in November of 902 CE? According to nasa.gov, astrophysicists rewound the clock on a comet observed and recorded in 1866, and determined that it crossed inside Earth orbit for the first time in 866 CE. This led to the meteor shower when Earth crossed the comet's orbit in November of 902 CE. When are the Leonids visible? In 1866, Italian Giovanni Schiaparelli became the first person to connect a specific meteor shower with a specific comet. Schiaparelli demonstrated that each November Earth travels through the dust trail left by Comet Tempel-Tuttle (55P / Tempel-Tuttle), a comet that orbits the Sun once every 33.17 years. The dust and debris that its nucleus leaves behind becomes the Leonid meteor shower. A century after Schiaparelli's discovery, Tempel-Tuttle was traveling 124,000 miles (200,000 km) per hour as it passed close to a point in space that would be occupied by Earth later that year. When our planet reached that point on November 17, 1966, people were treated to one of the best meteor showers in history. It was particularly spectacular in the central and western United States, with reports of thousands of meteors an hour. 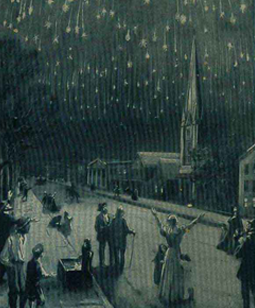 Encyclopedia Americana claimed that the Leonids on November 11 and 12, 1833 were even more spectacular, producing "200,000 meteors…between midnight and dawn, numbers of them brilliant, and many leaving trains." Meteor showers this intense are often referred to as meteor storms. The Leonid Meteor Storm in 1833 is the most intense meteor storm in recorded history. It was so intense that church attendence spiked since parishioners believed that Judgement Day had arrived. Other Leonid Meteor Storms were recorded in 1799, 1866 and 2001. These storms are, of course, the exception. Most years the Leonids only produce 15-20 meteors an hour. Over 58 observations of the Leonids exist (Mason, 1995), including six showers recorded by ancient Korean astronomers (Imoto & Hasegawa, 1958). What determines if the Leonids are spectacular or a dud on any given pass? The single largest determining factor is how close Comet Tempel-Tuttle passes to Earth's orbit once every 33.17 years. According to Don Yeomans, in 1833 and 1966 Comet Tempel-Tuttle passed 0.0012 and 0.0031 AU from the position in space that Earth would occupy later that same year. If Comet Tempel-Tuttle had arrived at this point in space on November 17, 1833, instead of earlier in the year, then the comet would have been closer than our Moon. Earth and/or the Moon would have been hammered by debris, fragments, and potentially even Comet Tempel-Tuttle's 2.2-mile-wide (3.6 km) nucleus. Do you want to see the Leonids? The peak for this shower in 2014 will occur on November 17 or 18. A waning crescent moon won't interfere with the show. Enjoy!